It’s easy, fast and secure. Secure and confidential! No need to share payment information with the Parish Office. Efficient! Set up direct withdrawals from you checking or savings account, debit or a credit card (Visa / Mastercard / Discover). Simple! Start, stop and change your contributions at any time. Convenient! No need to write a check or have cash available. Click the button below to set-up a recurring gift or make a one-time donation. 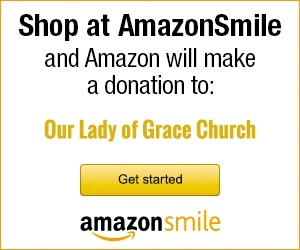 If you shop at Amazon.com, please consider going to smile.amazon.com and choosing Our Lady of Grace to receive 0.5% of all qualifying purchases you make when shopping through smile.amazon.com. Products and prices are the same, and Our Lady of Grace will receive a donation each time you shop! If you shop at Lucky or Food Maxx, please be sure to pick up a SHARES card from the Parish office, and swipe the card at check-out each time you shop. When you use your SHARES card, Lucky will donate 3% of qualifying purchases to Our Lady of Grace Church youth programs! There is no need to sign up or provide any information; simply swipe your SHARES card, and OLG will receive a donation from Lucky!